What is a kiki? : A kiki is the coolest party ever, that everyone finds out about the day after it happened and wishes they had been there. It's an insider community where everyone who might be considered a freak during their everyday lives is suddenly regarded as the most famous, beautiful, chic and celebrated person in the world. It's a magical, fantastic night; anything can happen, and only those who made it there will ever know exactly what did. 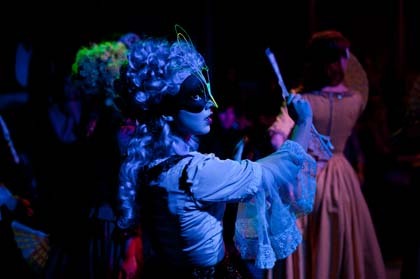 Tell us about Restoration Comedy: Restoration Comedy is not just a play, it's truly a three dimensional experience and a delight for the senses. Ed and the cast have created a world for the audience to step into and become a part of. From the moment you walk in, you are greeted by actors in sumptuous costume, singing and playing baroque music in an intimate, "salon"-style setting. The generosity of spirit that the performers embody while acting, whether it be ridiculous scenes of hilarity, or intimate, heartfelt scenes of moving depth, extends beyond our efforts on the stage and into our conversations and creative interactions with the audience throughout the night. Our goal is to move you, to lift your spirits, to leave you buzzing with joyful energy when the night is over. Who do you play in Restoration Comedy? : I am in the Dance Company/Ensemble, and am understudying Amanda. What’s the most outrageous costume you wear in Restoration Comedy? : That is very difficult to answer! I have to go with my Whore costume for the Whores and Johns scene near the top of the play. It's some pretty outrageous black sheer lingerie and neon underwear! Which cast member is the naughtiest? : Naomi Bland, hands down. In rehearsal, that woman has no fear and no inhibitions. I admire that about her. Sexiest? : That is truly impossible to answer, because every person in our cast is the sexiest person I have ever seen. I guess it comes down to a toss up between Rosa Gilmore, who plays Berinthia, literally the human embodiment of what I imagine a Greek goddess might look like, and Steve Stout in his four (maybe five?) -foot wig. Most likely to deceive? : Not really sure how to answer this one...but Ms. Jennifer McCormick has a pretty mischievous twinkle in her eye. What is your signature dance move? : I have a pretty fantastic moment at the top of Act 2 where I get to basically freak-dance with the floor. I will take full credit for that bit of choreography. Why should we come see Restoration Comedy? : Because it's unlike any other theatre happening in New York, because our cast and creative team is bursting with undiscovered talent, and because I can guarantee that you will walk away with a smile on your face and a song in your heart.